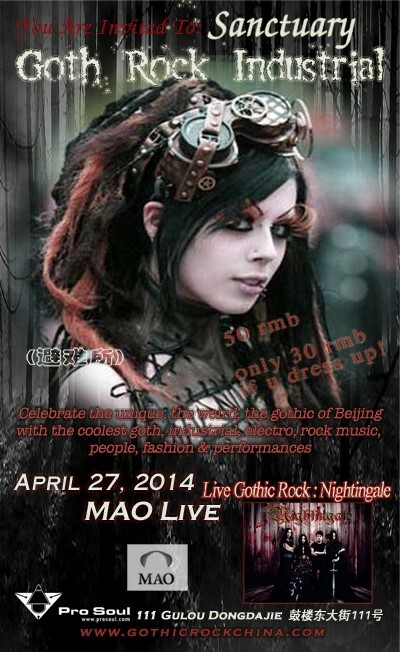 Sunday, April 27 2014 8:00 p.m. - 01:00 a.m.
50rmb, ONLY 30rmb with Gothic style dress! Celebrate the unique, the weird, the gothic of Beijing with the coolest cyber goth industrial rock music! NIN, KMFDM, Nightwish, Nitzer Ebb, Lacuna Coil, Rob Zombie, The Prodigy, Ministry, and more! Come and be a part of one of the coolest events in Beijing this month! And bring your friends so we can make this event great and do it every month! Join our Douban community page!